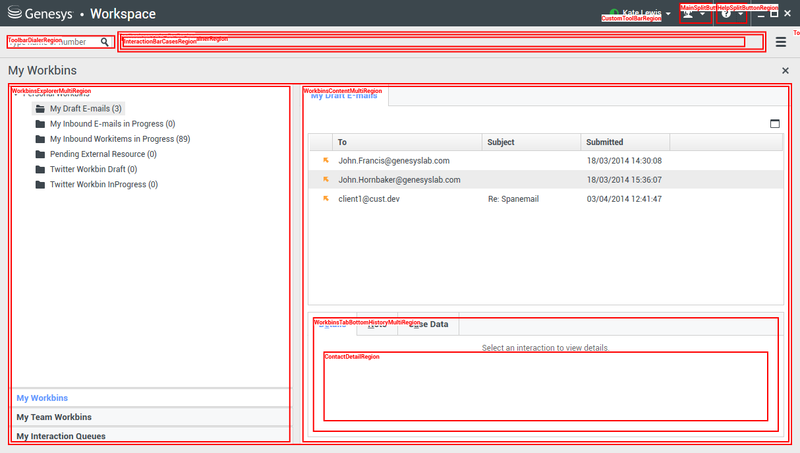 The ToolbarWindow (IToolbarWindow) <ref name="Windows" >Module: Genesyslab.Desktop.Modules.Windows</ref> is the top-level window which contains predefined buttons in the ToolbarWorksheetButtonRegion associated with specific working views. This toolbar contains views and regions which are activated depending on the user's input by clicking expandable button for instance. In 8.5, you can include Custom Modules and Views in the CustomToolbarRegion area. 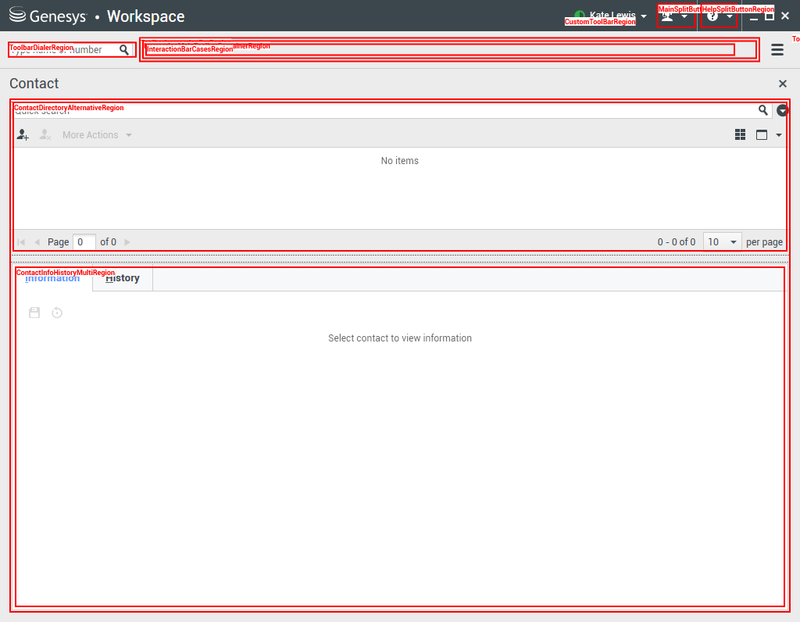 Custom modules can no longer extend the drop-down menus of the former Workspace button through the WorkspaceMenuRegion region. Instead, you should use the ToolbarHamburgerButtonRegion area to add menu items in the hamburger menu along with the out of the box items of this area, such as My Channels, My Campaigns, and so on. The ToolbarWindow; no working view is deployed. In blue, you can see ToolbarHamburgerButtonRegion. In red, CustomToolbarRegion. See also Changes in the Main Window Regions section. Added in 8.5; see the migration page for further details. The MyHistory tab is selected and makes MyContactHistory visible. Retrieved from "https://docs.genesys.com/Documentation:IW:Developer:ToolbarWindow:8.5.0 (2019-04-19 05:43:22)"